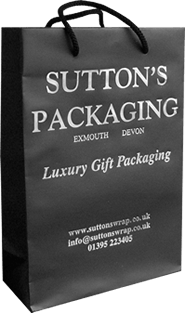 Since 1999 Sutton’s Packaging has been providing wholesalers and businesses with the best products from around the world whilst maintaining an ethical approach to business. Our dedication to quality and service has seen us grow to become one of the leading suppliers of tissue paper to the UK and Europe. We specialize in supplying tissue paper in reams, wholesale packs and resale packs to wholesalers and major users but we also supply, bags, gift-wrap, ribbons and seals from stock or made and printed to your own design. We pack own label products in pack sizes to suit your needs subject to minimum order requirements click here for details. We are the main supplier of SatinWrap tissue to the European market with the entire range of colours and designs available from stock. We supply in standard packs and sizes but we can repack into alternative pack sizes. We can also print tissue with your own logo or design. SatinWrap tissue is possibly the most environmentally friendly tissue available. It contains a high percentage of recycled pulp made up with sustainable virgin pulp and environmentally friendly soy based inks are used for printing. The use of biomass energy reduces reliance on oil and all waste is properly treated. In today’s market it is important to stand out from the crowd and incorporating your own logo into your packaging is a great way to increase your brand awareness whilst serving your packaging needs. We can supply your own branded tissue, gift-wrap, ribbon and seals and we are trusted suppliers to some of the world’s largest companies. We are members of the SEDEX ethical sourcing organisation. We are committed to the principles set out in the Ethical Trading Initiative Base Code.